I am not one of those moms that pines away for the days when their children were little. Don’t get me wrong, I loved raising my kids. And though sentimental by nature, I am not one of those ‘oh-where-have-my-babies-gone’ types. Each stage had its joys and its challenges and I loved them all. Some were more trying than others, but as a package, motherhood has been a great gig. But every once in awhile something hits me. 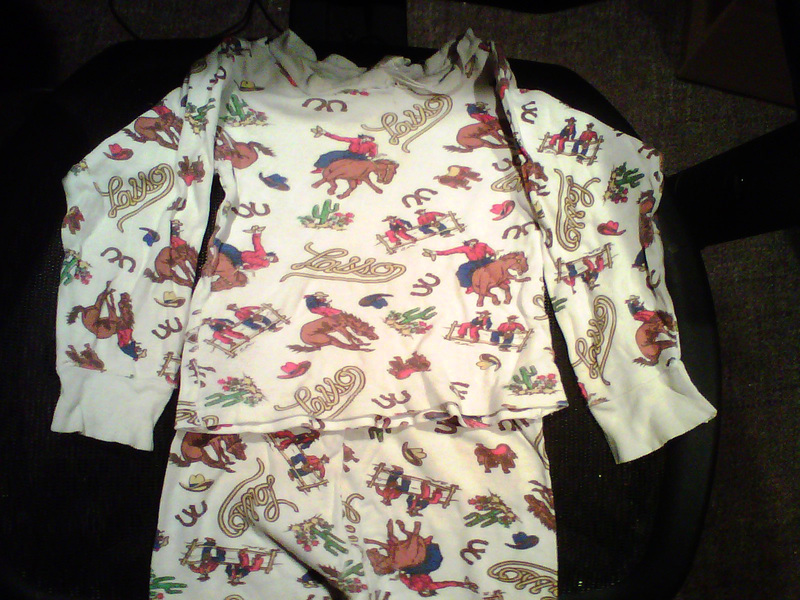 I am innocently cleaning the closet in my office (yes, I am still on the office project) and buried in the pile of quilting fabrics (yes, I was a quilter) was this tiny pair of cowboy motif pajamas. Not just any pajamas, but the ones that had to be washed constantly so that my son could sleep in them yet again. They are threadbare and soft as can be, with faint stains of what is probably maple syrup from the 1,000 waffles he ate at that age. Just the sight of them gave me that tight feeling in my chest that I get when a piece of my past comes crashing into me. Perhaps when he wore these is when we started calling him Buckaroo. We don’t use that name often, but when we do he tolerates it probably for the same reason we say it; it brings us back to little boy time we both loved. I took this shot and texted it to my now 19-year-old son with the caption ‘Bucka-f’ing-roo’. Sometimes you have to know your audience and tailor your message. Know what I mean? Awww man, so darn cute. Begs the question: were you really going to cut these up for a quilt? What a fun email. I know you said never, but one of my most treasured gift from my grandma was a quilt from old fabric I’d worn as a child. I was going to do that for my kids, but you’ve guessed it — I never did.